New Official Railroad Map of The United States And Canada. 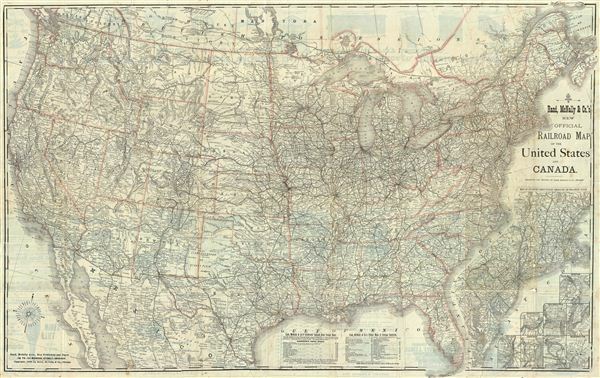 This is a fine example of Rand McNally's 1883 railroad map of the United States. This map covers all of the United States and the southeastern provinces of Canada. Nine inset maps in the lower right quadrant include a map of Atlantic coast states engraved on an enlarged scale, Boston, New York, Philadelphia, Cincinnati, St. Louis, Chicago, Buffalo & Niagara Falls, and Washington. The map is highly detailed and notes cities, towns and counties. The map is hand colored outlines to define state boundaries with relief shown in hachures. Various advertisements from the period appear on verso. The map is dated and copyrighted 1883 and was published by Rand McNally & Co., Chicago. Good. Original fold lines visible. Professionally flattened and backed on archival tissue.